John Francis Daley and Jonathan M. Goldstein make for an unusual pair. Daley is best known as a television actor, starring on the cult TV show Freaks and Geeks and now on Bones. Goldstein is a well traveled sitcom writer, contributing to shows ranging from The PJs to The New Adventures of Old Christine. Together the two have become one of the most in-demand and successful screenwriting teams in Hollywood. Their produced work covers a range of genres: the adult dark comedy Horrible Bosses, the broad comedy The Incredible Burt Wonderstone and this weekend’s release Cloudy with a Chance of Meatballs 2. In the following interview with Daley and Goldstein, the writing duo discusses the genesis of their writing partnership, the re-writing process on Cloudy 2 and the difficulties of writing for animation. In addition Daley and Goldstein gave updates on a number of their upcoming projects: Horrible Bosses 2, Vacation (the remake to which they’re still slated to direct), their in-development pilot Punching Out and the just-sold-to-New-Line Bad Santa-esque The Bus Driver. For the full interview, hit the jump. 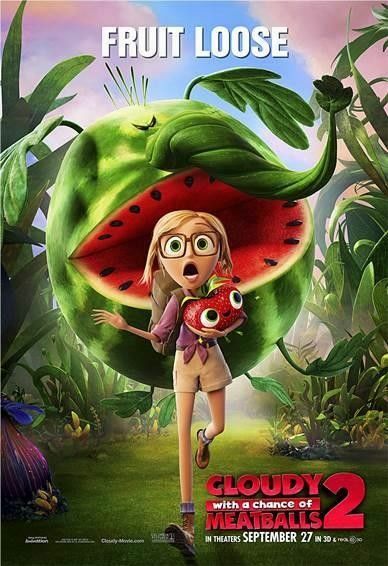 Congratulations on Cloudy with a Chance of Meatballs 2. I really enjoyed it. Jonathan M. Goldstein: Thanks. I’m glad to hear that. Of all the things we had written it was the one we had seen the least when finished – so we didn’t know quite what to expect. How did you both get involved on the film? John Francis Daley: I think they were fans of our work on Horrible Bosses and we were big fans of the first one. 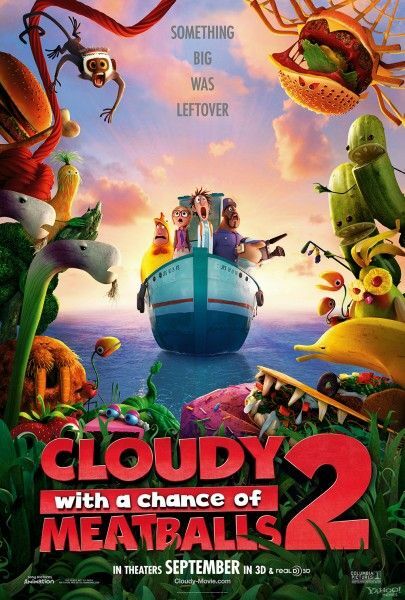 Erica Rivinoja had written the first draft of [Cloudy 2]. We added to [that draft] and went from there. It was about a year and half ago or two years that we came in. How did the draft change when you came onto the film? Goldstein: The thing about animation is that it’s a constantly changing process. They talk in terms of sequences – so there’s like thirty different sequences in a movie and at anytime those were shifting or being taken out or being replaced. The plot of what Chester V (the villain) is doing changed numerous times. Daley: The way it all culminated in the end changed as well. The basic structure is what was there all the time. They go to an island where there’s these food creatures. Beyond that it was a constantly evolving process. How many of the food-animals did you guys create yourself? Goldstein: They had a number of them already [done] when we came in. In fact they had drawn them. It’s funny when you go into Sony Animation, you go into the conference room and the walls are covered with drawings of those things. Daley: You feel guilty pitching cuts because you can tell they’ve already spent hours and hours, weeks of their lives developing these things. And then they can go away in a single meeting. Goldstein: I think Misquitoast is one of ours. The ‘Leek’ in the boat was certainly our joke. I remember spending a day just combining foods and animals and trying to find the funniest versions of those and writing down a long list. How do you balance creating your own stuff in relation to all the things that were already in place? Daley: We try to add what we think is funniest and make it the most succinct way to get the story across. I wouldn’t say we put it in our voice but we certainly put it in the funniest kind of voice we imagined for the movie. They sort of develop it from there. We hand it off and they make changes. The story board artists are in essence directors as well because they decide how each of the characters act. We would bring them these sequences where they would make changes and put it in their own voice and then they would bring it back to us and we would make changes [again]. It was the most collective group of collaborators we’ve ever worked with. Is that the biggest difference between animated and live action films: the amount of people who have an influence on the project? Goldstein: Yeah – I would say so. That and when you’re doing live action you don’t normally get to see the thing before it’s in production. In this case we’d go in every couple weeks and look at animatic and sketches. The way they do it – is they’ll put it up on a screen and the storyboard artist who worked on that sequence will talk you through it. Kind of like a pitch session. Then they would leave and we would sit there with the directors and say ‘Alright – what if we change that? What if we do that?’ It’s very different from live action. Daley: It’s like live action if you reshot every scene a million times after finishing the movie. Because even apparently by the very end, a few weeks before they were screening it for the world premiere, they were making changes. That’s just simply something you can’t do on live action… Another thing that makes the process different is we go in there and are completely immersed in [that] world for however many weeks and then we would leave and they would be animating for however many weeks and we wouldn’t have anything to do with it. Then we would come back and see all this work that they had done. So it just took a lot more time than it would on anything else. How difficult was it to recreate the established voices of the characters from the first film? Daley: It actually makes it easier because there’s already these established characters from the first [Cloudy]. When you can [imagine] that Earl Deveraux voice, it makes writing the joke on the computer a lot easier then if you’re just trying to picture what the actor is going to do with the part. How did using Jurassic Park: The Lost World as a template for the sequel come about? Goldstein: That was (the first film’s directors) Chris and Phil’s s idea. I think coming off the first one, which is a disaster movie, they conceived the sequel as a monster movie. There’s a heavy social commentary in the film – a denouncement of corporations. How heavily were you involved in that message – turning Steve Jobs into the villain of the film? Daley: Well – it’s not just Steve Jobs. There’s a little Richard Branson in there. Goldstein: Yeah that was something we had a lot of fun with, taking the Apples and Googles of the world and turning them on their head. Daley: Just any corporation that claims, “We’re here to have fun and we got all these recreational things to keep you motivated!” It’s silly to me because at the end of the day it’s all about work. Goldstein: Also the contrast between the individual inventor – which is Flint – and the larger conglomerate, the international corporation that takes people like him and can either exploit him or not. Do you favor those animated films with a hidden message for adults to latch onto? Daley: I think that’s pretty crucial for it to succeed and be something more than just something you put your kid in front of and turn on the DVD. We wouldn’t have got involved if it were just for little kids. We wanted to write something that works on both levels. Goldstein: After having seen the first movie, we became really excited about it. That movie did such a great job of finding a line between what appeals to kids and what appeals to adults. How did you both come about forming your own writing team? Daley: We worked on a sitcom called The Geena Davis Show back in 2002 or 2003 and Jonathan was a staff writer on it and I was an actor. We found that we shared the same sense of humor and we started writing together. Goldstein: Personally I’d been writing in sitcoms for twenty years. We had this idea for a movie and we just sat down and wrote it together. We went on selling it to New Line. It was called The 40,000 Dollar Man. It was never produced but it got us our foot in the door. What is the status on The 40,000 Dollar Man? Goldstein: You know it’s a question one would have to put to New Line. It’s tricky because it’s a very cast driven movie. You need that star that can embody a pretty broad physical comedy role. Daley: Yes – it’s also pretty broad too. And I feel like the appeal of broad-type movies are cyclical. I don’t know if we’re in that cycle right now. Goldstein: Well – like Anchorman. That could help get that subgenre going again. It might give us a little push. How do you split the writing duties? Do you write together or separately and then go over each other’s work? Daley: We always write together. It’s generally in the same room. If not, we work online together. We find [writing together] makes it the most easy to come up with organic dialogue because we’re able to bounce ideas off each other in the moment. Goldstein: Usually we find if something makes one of us laugh and not the other, we’ll keep trying until we find something we both think is funny. You’ve both primarily worked in television – what made you approach writing for film instead of TV on the outset? Daley: It was really just the idea of The 40,000 Dollar Man and knowing that was more suited for feature length than for TV. We had actually written a pilot together before that, which we didn’t go out with. But it was what made us realize we could work together well. Well you do have a pilot now in the early stages of development. What’s the status on Punching Out? Goldstein: We’re actually outlining it right now for the network and we’ll get their notes and then it will be off to script. With any luck, we’ll get to shoot it. Daley: Yeah – we have a dream cast in mind and we hope we get at least one of the people were thinking of. But it’s a very different process for me. I think this is the first TV thing I’ve worked on in a writing capacity and like animation it’s a very [long] process. There are so many steps in getting the thing made. It’s very new and interesting. What are the differences you find writing for television versus film and animation? Goldstein: To a large extent: it’s about economy of space. You have so little real estate when you’re writing a half hour show. It’s really twenty minutes. So you have to with a pilot introduce all your characters, set up the premise in a way that shows the potential for a series and make it funny and do it all in about thirty-five or forty pages. It’s very hard. Goldstein: But that said at the same time TV is a more quick process because we’ve worked on movies, where we were involved for years before it got made. In this case we’ll know within a few months if this is going to live or die. And that will be gratifying. You guys also wrote a draft of Horrible Bosses 2. What’s the status there? Daley: We wrote the first version of the script and there’s been a little bit of a shake-up on that. Seth Gordon left and Sean Anders is going to direct it now. Unfortunately we were in the thick of developing Vacation – which we’re slated to direct – at the time New Line needed more work done on the script so Anders and John Morris came in and did a rewrite. So we’re not day-to-day involved at this point. 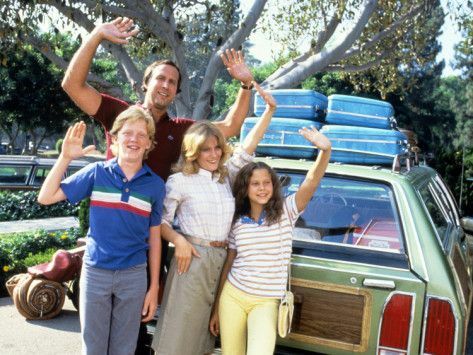 Speaking of Vacation – that’s a classic film series. How are you approaching doing a redo of it? Daley: We want it to stand as its own movie. We don’t want it to be too much of a nod to the original but still pay our respects. The original inspired both of us, I think, to become comedy writers. It’s one of those quintessential comedies from the 80s that everyone admires. So we need to treat it with that level of respect but make it our own thing at the same time. Goldstein: The plan is to take the [family] to Walley World. As we know though this process is constantly evolving and changing. So there isn’t a definitive answer as of now – but the idea was always that Rusty has grown up and he’s taking his family on a road trip to Walley World – which he fondly remembers… We think of it as a sequel to the first one without too much of an acknowledgement of European, Vegas or Christmas. Knowing that you’re slated to direct the film, does that influence your writing process? Daley: Yeah – we’re actually taking it seriously. Goldstein: We’re more aware of budget considerations. We’re not going to write something that is huge involving helicopters and explosions because we know we’re just going to have to cut it later. Daley: Which is a shame because I had the idea of an explosion exploding. An explosion on an explosion. I don’t think that’s ever been done before. It’s a series of micro explosions off an explosion. Daley: We always for better or worse try to put on paper what’s going up on screen – whether we’re directing it or not. It’s really just an extension of that habit which is trying to tell the reader what the movie will look like. Ultimately that is the job of a screenwriter to a certain extent. What’s the status on The Bus Driver? Daley: We’re working on that simultaneously with the TV show right now. It’s sort of in the vein of Bad Santa and The Bad News Bears. It’s basically this anti-hero recruiting these kids to help him pull off a heist. We’re about half way through the script right now. Goldstein: It’s a lot of fun. It’s probably closest to Horrible Bosses in tone. There’s an anti-hero element and it’s a little dark in places but I think it’s a lot of fun. Daley: It’s funny – we went to the premiere of Cloudy with A Chance of Meatballs 2 and it’s extremely kid friendly and to go from that to writing The Bus Driver, which is not at all kid friendly despite having kids in it. Is that a deliberate decision on your part – to write children films and adult films to cover this whole gamut of genres? Goldstein: Yeah – I think it’s a deliberate on our parts to diversify our portfolios. I mean I have a kid now so it’s also fun. I took my one-month year old son to the premiere and he actually watched the whole thing, which is pretty amazing. But it’s fun to challenge yourself and not just do one thing. 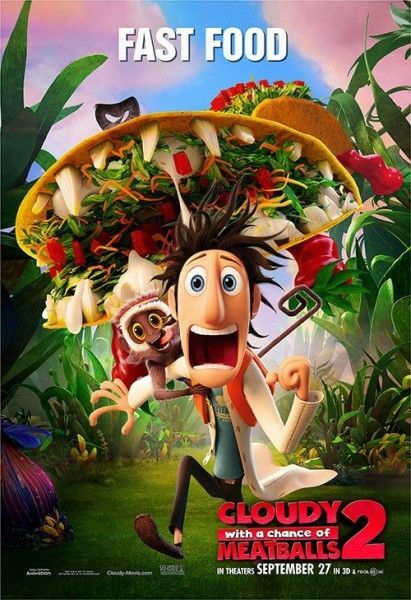 Cloudy with a Chance of Meatballs 2 is now in theaters everywhere.